This page is written by the game's inventor, Joe Joyce. This game is a favorite of its inventor. As chess evolved from shatranj in the West, pieces gained power by becoming long-range sliders, producing an abstract game where most pieces can cross an open board in a single turn. Eastern variants stay closer to the beginnings of the game, which featured a number of short-range sliders and leapers, but the power pieces still seem to be long-range. What if long-range pieces did not come to be so dominant? Suppose the short-range pieces of chess' infancy became more powerful by gaining additional short-range moves? Great Shatranj examines some potentials of these pieces, offering 5 different pieces that slide 1 square or jump 2 squares. Each player has up to 8 leapers on the board, giving the game a noticeably different flavor. 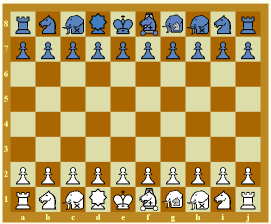 This game is taken from "Two Large Shatranj Variants", which contains a complete list of alternate pieces and optional rules. All presets use "Grand Shatranj Alfaerie" piece sets. The Alfaerie piece sets were created by David Howe. The Grand Shatranj piece set includes some new pieces by Joe Joyce, created for Mr. Howe's Alfaerie set. The presets do not rules check. Players are encouraged to try out different pieces. King. The royal piece. This is the standard chess king, moving 1 square in any direction. The king may not move into check. General. Moves as the king, 1 square orthogonally or diagonally. Minister. Moves like the knight, dababbah, or wazir. It slides 1 or jumps 2 squares orthogonally, or jumps in the standard knight's "L". High priestess. Moves like the knight, alfil, or ferz. It slides 1 or jumps 2 squares diagonally, or jumps in the standard knight's "L". Elephant. Moves as an alfil or ferz. It may slide 1 or jump 2 squares diagonally. kNight. This is the standard chess knight, jumping 2 squares, one orthogonally and the second diagonally outward. Pawn. A standard chess pawn, always moving 1 square forward and capturing 1 square diagonally forward. There is no double-step option. Rook. Optional replacement for dababba. A standard rook, sliding any number of squares orthogonally. Win by checkmate or by baring the opponent's king without your king immediately being bared by your opponent. Any other outcome is a draw. Pawns promote on the eighth rank. Pawns may always promote to a general. Pawns may promote to lost pieces, with restrictions. One pawn may promote to either (lost) member of the following 4 pairs of pieces: dababbas; knights; elephants; minister-high priestess. If promoting to a lost elephant, the pawn must promote to the opposite color of a surviving elephant. There is no castling. As there is no pawn first move double step, there is no en passant. This game was playtested by David Paulowich. He suggested the option of a rook in our initial discussions, as he felt people would find the dababba too weak. Then he checkmated me with a dababba in our playtest game. Tactics in this game can get rather sharp. As this game has been played, a few people have offered suggestions. Following are the ones that people might reasonably and easily implement. Several people have suggested that the pawns get an initial double step. The two people I remember making the suggestion are Jeremy Good and Graeme Neatham. I, personally, would be more inclined to use it in Grand Shatranj than here, but several players have mentioned it over the past couple of years, so I offer it to you here. If you decide to use it, the players then must decide whether en passant or passar battaglia rules are used. HG Muller implemented this game in one of his software engines, but uses the "Jumping General" [pasha: DWAF] as the default piece in place of the "general" [guard, man: WF], stating he preferred the 2-square range piece as more compatible with the other non-royal pieces. LL Smith suggests a "king's leap" of 2 squares in any direction, possibly including capture, as a reasonable analog to castling. This 2 square leap [with optional capture] occurs only on the king's initial move, and can be further restricted by not allowing the king to start, move through, or land in check. I feel this rule is obviously in keeping with the spirit of the game. Game design by Joe Joyce.